There was a time not too long ago we’d hike through a meadow or a prairie and see so many Poweshiek skipperlings fluttering about we’d barely notice. A Monarch yes, a Poweshiek skipperling hardly. 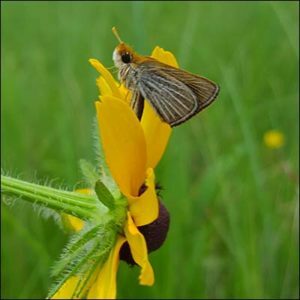 A Poweshiek skipper, an endangered species on the verge of going extinct. USFWS Phtoto. But starting in the early 2000s, biologists noticed an abrupt decline in Poweshiek populations. Reasons for the rapids decline ranged from loss of habitat — pristine, never-tilled prairie grasses — to climate change that includes hotter summers and wetter springs. By 2014 the butterfly was listed as an endangered species and soon federal, state and other researchers were breeding Poweshieks in captivity, and reintroduce them to Oakland County, and in particular Shiawassee Basin Preserve, strongholds for the species. But even in Oakland County their numbers are not encouraging. Four years ago as many as 300 of the butterflies could be found locally. Now the count is less than 70. There is a very good chance the species could be extinct in as little as two years. Poweshiek skipperlings have a one-year life cycle, and are in flight only for one month, from mid-June to mid-July, when it breeds and the female lays her eggs, and both the male and female die. A green caterpillar hatches over the summer and stays in that form over the winter, when it enters a hibernation-like state. We recently updated our Shiawassee Basin Preserve trail map as place to witness many species of butterflies. But also possibly a Poweshiek … or if not then the trail of its extinction. To download the map or for more information on this 515-acre near Davisburg in northern Oakland County Click Here.